With growing demand of using portable devices such as mobiles and tablets to browse the Internet, it has pushed the boundaries of developing a website that is compatible with all devices, regardless of different screen sizes. A responsive web design is an elixir to this problem. A responsive web design is a website that works well on all devices and delivers excellent user experience to both mobile and desktop users. Depending on the device, the pages of such website is reformatted, ensuring it fits well in all kinds of devices having different screen sizes and remain user-friendly. In the past, two separate URLs or websites were used for mobile and desktop users to offer pleasing experience. This, approach, however, didn’t go a long way as currently mobile devices feature different screen sizes and having only two URLs for only two screen sizes is not a one-size-fits-all solution. This is the point where a responsive web design does the trick. 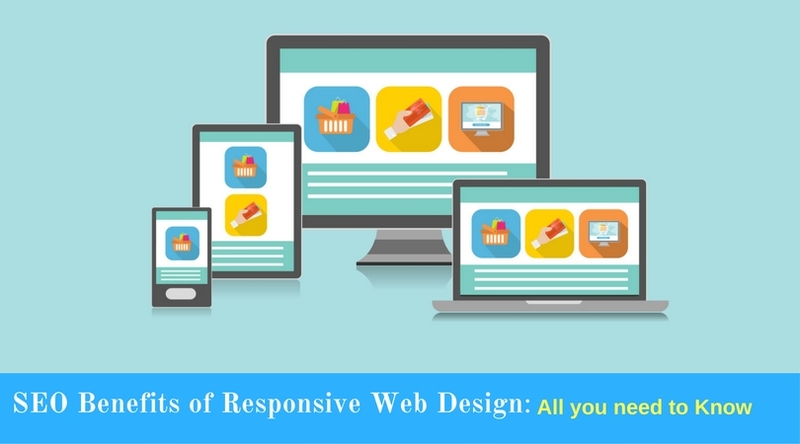 Why a Responsive Design causes a Sensation in the web Industry? Note: Recently, it has been announced by Google that it is turning to mobile-first index, and thus pushing the demand for having a responsive web design that is effective on all devices. As Google plays the role of a judge to rate your website, you must concentrate more on what Google loves. For your information, Google favors responsive design and it is considered to be the industry’s best practice when it comes to web designing. The reason being responsive websites have only one URL, same HTML and other files, regardless of being used on different devices. Having such a website makes the tasks of Google less painstaking as it can easily and efficiently crawl, index and organize content. Also, sharing of content and linking the content with other website for users becomes less of a hassle as the content are updated on one website and one URL. Having a responsive website is synonymous with one URL that works effectively on all devices. When you create separate URL for desktop and mobile, your content is considered to be duplicate between your own website. This is why Google can penalize you for sharing same content on two different URLs. When you have a responsive website, you are far away from this issue as you need to maintain only one URL. Bounce rate is a major concern if your website doesn’t function effectively on mobile and tablet, even if it has a good rank in search results. The dissimilarity between a website and mobile content can bring up the bounce rate for a mobile website. This bounce rate is considered as a sign by Google that a website is offering irrelevant content to users, eventually a website suffer from a drop in rankings. A responsive website is an elixir to this aforementioned issue as it offers better user experience and thus prevents you from falling prey to low bounce rate on your website. Always remember that high bounce nullifies your SEO efforts for your website. A responsive website blesses you with better engagement on social networks. As you own only one URL, when your user shares your website content on social media and if that link is clicked from any other device, it looks good. It is, otherwise, difficult to view your content if a mobile user clicks your desktop link or a desktop user clicks your mobile website link. A responsive website cut down on your efforts for digital marketing. When, for example, you have two different URLs for mobile and desktop, you need to put in double effort and face difficulties in promoting both of your websites. Also, you may face discrepancy of rank in both of your websites. One may rank higher while other may not on search engines. When you promote your website on the Internet, you have no idea whether visitors view your promoted link on mobile or desktop and thus leaving them with a bad experience when browsing your data. Having a responsive website keeps prevents this issue. Going responsive enables you to make most of mobile and tablet traffic while offering the best user experience. Recommended by experts, responsive websites are given more preference by the marketers as it eases the effort of managing SEO strategy. Having responsive website is not an option; it has become an important facet of digital marketing industry. These above-mentioned reasons, however, are enough to shift your website to responsive design. Get your website redesigned to responsive and witness the difference in terms of ranking. a website/web app for a paying client? Or is it better to use a paid template? Pretty piece of content material seo guru. I discovered your website plus accession investment capital to assert i always get actually treasured account your blog site posts. In any case I’ll be opt-in in your feeds or maybe I results people obtain constantly quick. Nice article and very informative as well. Thanks for sharing these great tips so that the web designers can avoid the common mistakes. I really do take into account many of the ideas you’ve got unveiled within your article. They are actually convincing and can absolutely do the job. Still, a content are certainly quick for starters professional web design software. Might you please extend them slightly through next time period? Information article. Good publish.. bulk sms cheapest I merely located your blog site and also wanted to mention that We have actually liked searching your website articles. In fact We will be opt-in for the feed with this particular intending you’re writing just as before soon! Now i’m definitely fascinated using your producing capabilities and also with the design and style in your website freelance web designer london. Is it the settled issue or even do you colorize it for you on your own? At any rate sustain the nice high quality writing, it’s rare to view an incredible blog page like this one currently. An individual essentially help make drastically reports I may point out. This is actually the very first time My partner and i been to your internet site therefore much? My spouse and i pleasantly surprised while using study you have made to make this particular post incredible best web designer. Fantastic process! Extraordinary factors right here web game development. I am very happy to appearance your post. Thanks a ton and I’m looking ahead to touching you. Do you want to make sure you fall me a e-mail? I would not be aware generate income ended up the following, nevertheless i believed this particular send was previously superior. I don’t have an understanding of which you are having said that surely you are going to the well-known digg in the event you may not be previously web design careers. Best wishes! Good post. I was checking continually this web site that i’m prompted! Extremely handy data exclusively the eventual part 🙂 I personally cope with such information and facts a good deal. I was trying to get this kind of data for your really extended time period junior web developer jobs. Thanks and also all the best. I have already been checking on-line a lot more than Three hours now, nonetheless My spouse and i hardly ever found any kind of fascinating article for instance you. It’s wonderful value satisfactory in my situation color blindness test book free download. Professionally, if perhaps virtually all website owners in addition to blog owners made superb written content as you would, the online world will probably be a lot more helpful than any other time. Woah this particular web site is fantastic i really like mastering your site content. Be up the terrific works of art! You know, plenty of people are seeking all over with this information, you could assistance these people drastically internet promotion. website designing company Thank you for the excellent writeup. That the fact is was obviously a amusement bank account the item. Glance sophisticated in order to extra produced flexible within you! Moreover, exactly how might we all keep in touch? Excellent writing. I agree that responsive design is must for the growth of the business. Most of the people are using different devices to operate. So it is really necessary that the design you are choosing must be compatible with that device. Thank you so much too all and share this blog if you like it.